Cranberries are like fall’s precious jewels. Gorgeous shades of ruby red and that unmistakable flavor combination of tart-meets-sweet. Proof that the biggest of flavors can come in the smallest of packages. In fact, Thanksgiving wouldn’t be Thanksgiving without them. But we’d be missing out if all they ever did was sit quietly next to the stuffing and turkey. Incredibly versatile, cranberries add a splash of flavor to appetizers and a splash of color to your tabletop decor. It’s peak season and November is the perfect time of year to enjoy these delicious and beautiful cranberry-studded ideas. Set your table with rich colors and natural elements. Fresh cranberries add an elegant pop of color and make a beautiful garnish for water glasses and cocktails. Sugared cranberries turn a simple cheesecake into a gorgeous, sparkling dessert. Make your own by soaking two cups of cranberries overnight in a simple sugar. Rinse, pat dry and roll in organic raw cane sugar. They’re sweet, tart and delicious on their own. We dressed the center of our table with understated sprigs of fresh eucalyptus positioned lengthwise right on the tabletop. A few randomly placed votives in rustic golds and coppers added a flicker of candlelight. Keeping the centerpiece details simple and low in height lets the focus remain on our guests and the delicious food. Sometimes the simplest ideas make the most beautiful touches. Like adding a sprig of fresh thyme and a toothpick with cranberries to each napkin. 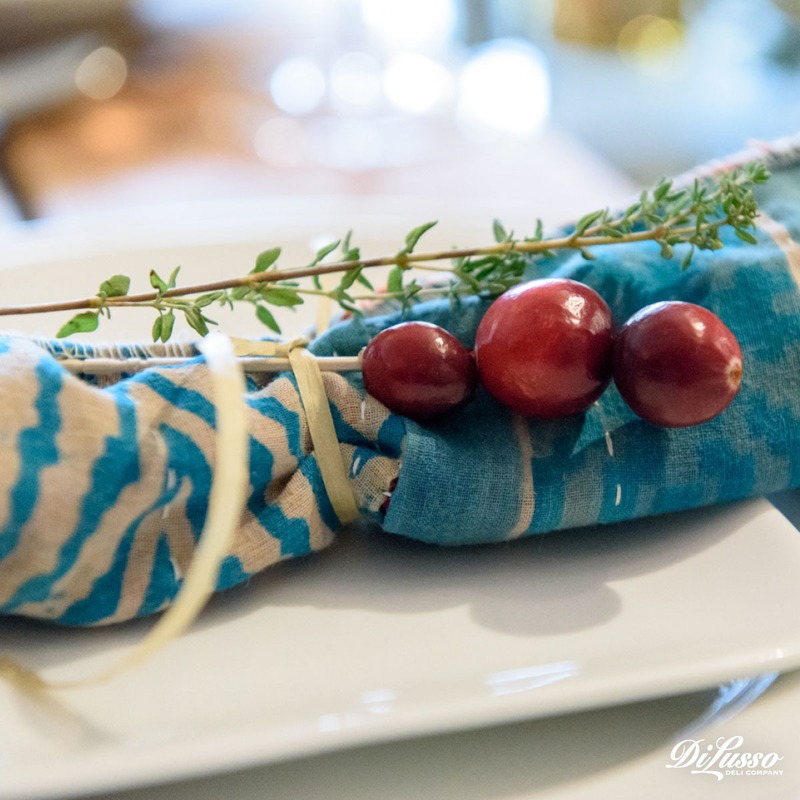 Rolling mismatched napkins and tying with a single strand of raffia creates a beautiful and personal touch. Each place setting unique. Chilling your wine was never so beautiful. This Cranberry and Eucalyptus Chilling Ring is as lovely as it is functional. And a brilliant conversation starter! 1. Start with a 2 gallon or 5 quart paint mixing bucket and a 2 liter plastic soda bottle for the center ring. 2. Cut off the top of the soda bottle and tape it down in the middle of the larger bucket at the bottom. 3. Weight the soda bottle down with whatever you have. A wine bottle is perfect. 4. 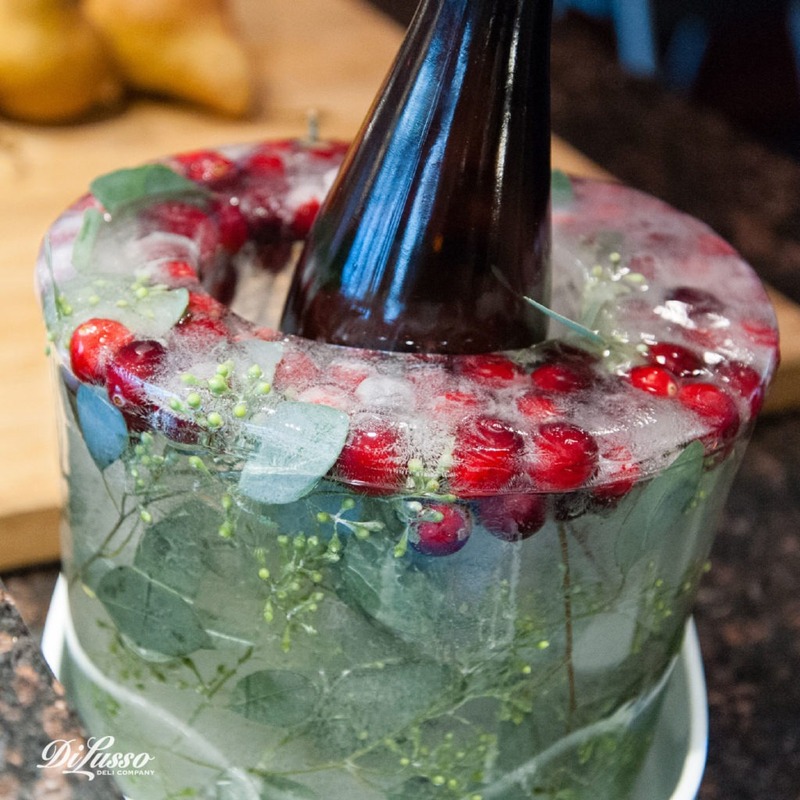 Fill the ring in the bucket with distilled water so it will freeze clearer than regular tap water and add in greenery, herbs and cranberries. Kumquats, sliced grapefruit or oranges, in-shell nuts; really anything you have on hand will work beautifully. 5. Tape the soda bottle in place from the top, securing it to the sides of the bucket. 7. Run the bucket under hot water, remove and discard the soda bottle. Remove the chilling ring from the bucket and place in a low bowl or ice bucket when you’re ready to chill and enjoy some wine or bubbly. 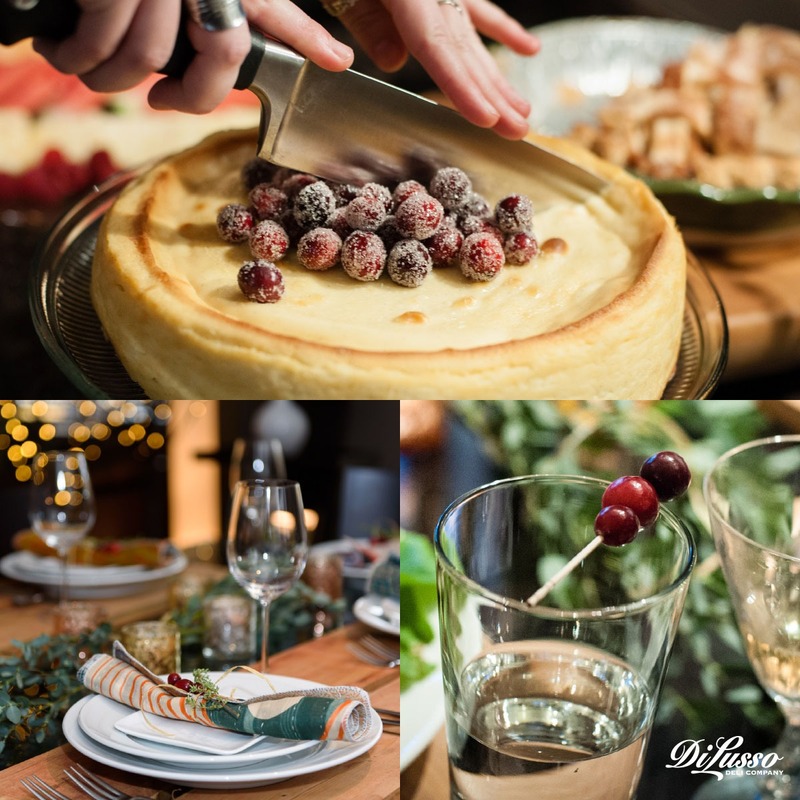 Not only do cranberries make beautifully festive accents to your home and entertaining decor, they add a delicious and gorgeous touch to your entertaining menu. 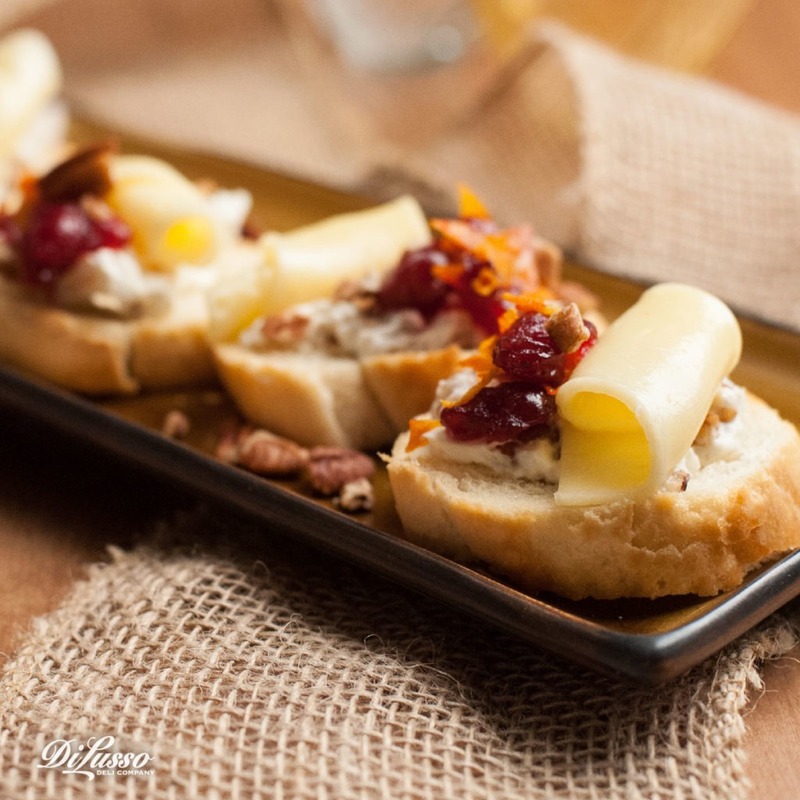 Welcome your guests with a tray of these lovely Havarti Cranberry Toasts. The sweet, tart bite of the cranberry paired with smooth and nutty Havarti is a delightful combination and they couldn’t be prettier. We love serving small bites like these. Full of flavor and you’ll still have a free hand for some wine or bubbly. Another favorite for entertaining are these Goat Cheese, Ham & Cranberry Pastries. 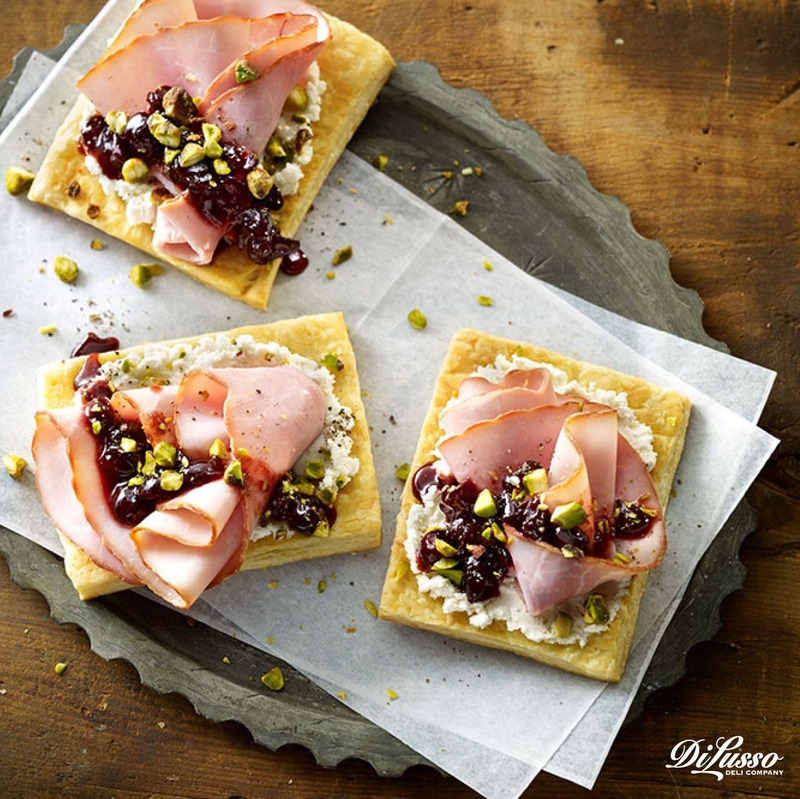 Melt in your mouth puff pastry is topped with delicate folds of DI LUSSO@ Ham and Cranberry Mustard, goat cheese, cranberry chutney and a crunchy sprinkle of chopped pistachios. Perfect with wine and conversation.